We seldom get "nectar" coffee in the USA because it is such a limited picking. What makes "nectar" coffee? It is the first picking of the harvest, right after the rainy season, with the highest sugar content (sap/nectar) in the bean before the dry season really sets in. Farmers often give this micro-harvest special treatment, as in this case when the producer adjusted the washing methods to minimal water, to preserve some of the pulp to enrich the beans during sun drying. When we talk about "sugar" in coffee, it is not to say that the coffee tastes like it has been sweetened, but rather that the character of the coffee is so smooth and free of bitterness due to the "nectar' present in the bean during processing that the coffee is perfect for drinking black if desired. 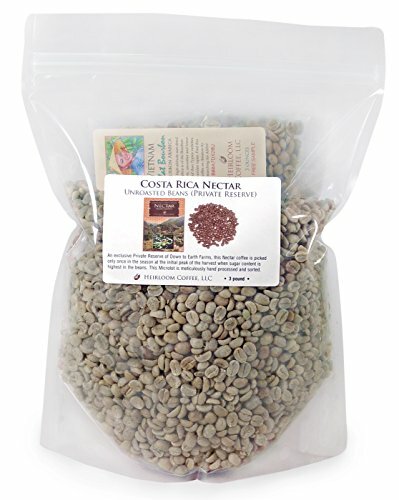 In Costa Rica, the tradition is to serve coffee with warm milk and sugar, but in the case of the nectar coffee, it is often consumed without any added sugar, because the brew already has a strong honey taste and tone to it. The amount of "honey" in the taste is adjusted by the roast level. You will enjoy trying this coffee at dark and medium roasts to compare the difference, it is amazing how different the profiles are. As with the main harvest, this coffee is safe & sustainably grown with virtually zero environmental impact, at altitude of 2000 m (~6000 feet), in the single origin of Dota canton, Tarrazu. If you have any questions about this product by Heirloom Coffee LLC, contact us by completing and submitting the form below. If you are looking for a specif part number, please include it with your message.